Perfect hotel. 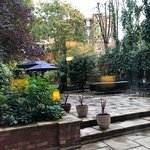 Friendly staff, nice breacfast, so cosy little garden with smoking area in the inner yard, comfortable and large rooms, not like in all other London hotels, I have been. I was so nicely surprised when they propose me to upgrade my booking for free. For sure I will recommend this property to all my colleagues. The price you found is 12% lower than this hotel's average rate of $277/night. The price you found is 35% lower than this hotel's average rate of $268/night. The price you found is 16% lower than this hotel's average rate of $399/night. The price you found is 47% lower than this hotel's average rate of $745/night. 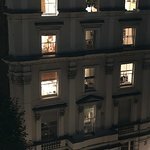 A one-nighter at Vincent House at Notting Hill Gate. It’s a semi-residential establishment and at first site, a bit ‘office-block’ looking. The price, telephone booking and reception on arrival was great. My room was ‘spotless’ and much larger than expected - coffee table and two tub chairs. Bathroom a bit tight, but fine. Overlooked the street which was a touch noisy later in the evening ... but a reminder that London is always alive! Dining room was large, clean and busy with self-service for breakfast (included) and dinner. Supper was ‘home cooked ‘ - consommé vegetable soup was wonderful, followed by salads, main course, cheese and puddies, all for £15! Comfortable communal sitting room and inviting courtyard too. As a novelty I felt like James Stewart in ‘Rear Window’ ... With a view opposite! Wonderful location (5 min walk to Notting Hill Gate station, close to many bars, shops and restaurants, a short walk from Portobello Road Market, pleasant and safe neighbourhood, including at night). 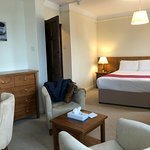 My superior room consisted of both a spacious (for London!) bedroom and a separate living room. Clean accommodation with enough storage space (except in the tiny bathroom). Wi-Fi worked well, hot/cold breakfast was good, nice communal area and garden. Staff was friendly enough for Europe though probably below US service standards. As other guests have already mentioned, the duvet is also the comforter. Not sure how sanitary this is. Would still recommend and would stay there again. 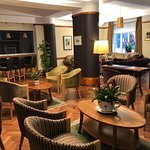 This is a fantastic hotel 2 minutes walk from Notting Hill tube station. Situated on a residential street is very quiet with very little passing traffic. It does not quite look like a hotel as in previous life used to be a residential building however don’t be fooled.... great rooms , bar, outside seating areas, good breakfast. I shared a "twin" room (shared bath, inside room, but outside the two separate bedrooms) with a friend in early May 2018. Staff was excellent and accommodating. Breakfasts (included) were superb. One can, with prior arrangement also arrange a dinner as well for about 15 pounds (we brought our own wine). There are permanent residents there, since the place was once a resident for workers. There is a bar and sitting room open to all and a lovely garden. The Notting Hill tube station is within walking distance (also close to many restaurants and shops). Would definitely stay here again. The price was right and it was immaculate. Had a bit a trouble at first getting the wifi to work, but soon all was right.